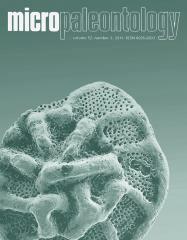 ABSTRACT: Twenty lacustrine – brackish water ostracode species are described from the recently discovered early Danian Planktic Foraminiferal Zone P1a sediments in the Deccan Inter-trappean beds of Jhilmili, ChhindwaraDistrict, Madhya Pradesh, India. These include two brackish water species – Neocyprideis raoi (Jain 1978), Buntonia sp. - and 18 lacustrine species of which one species - Strandesia jhilmiliensis - is new, 15 species are assigned to previously known species, and 2 species are left in open nomenclature. The Inter-trappean beds in the central Deccan volcanic province of India were previously mostly considered as Maastrichtian in age but at Jhilmili, on the basis of associated planktic foraminifera, their deposition clearly persisted into early Danian time.